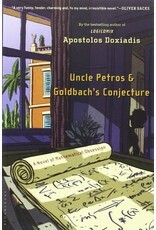 In this critically acclaimed international bestseller, Petros Papachristos, a mathematical prodigy, has devoted much of his life trying to prove one of the greatest mathematical challenges of all time: Goldbach's Conjecture, the deceptively simple claim that every even number greater than two is the sum of two primes. His feverish and singular pursuit of this goal has come to define his life. Now an old man, he is looked on with suspicion and shame by his family-until his ambitious young nephew intervenes. Seeking to understand his uncle's mysterious mind, the narrator of this novel unravels his story, a dramatic tale set against a tableau of brilliant historical figures-among them G. H. Hardy, the self-taught Indian genius Srinivasa Ramanujan, and a young Kurt Gödel. Meanwhile, as Petros recounts his own life's work, a bond is formed between uncle and nephew, pulling each one deeper into mathematical obsession, and risking both of their sanity.